S Scale Model Railroading in France! The BigHorn Sheep Canyon RR by Philippe Coquet. After 18+ years of HO scale modeling (US prototypes), Philippe has now switched to S scale. After 18+ years exclusively dedicated to U.S. HO scale modeling; with boxes of kits & rolling stock piling up; a first HO 20x12ft HO turnpike built over the years in a Paris basement, but now sort of worn out; and the layout of all dreams still out of sight for lack of basic square feet reason. Let's say I was a bit tired; searching for new feelings; new start. With some of my French friends "playing around" with S scale for some time, I decided to follow them, trading some of the HO stuff, and buying a few nice S scale brass "jewels." 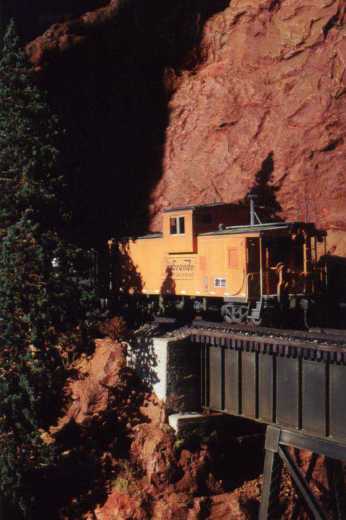 Chosen location (Big Horn Sheep) is a pretty neat spot of former D&RGW western main line of the Royal Gorge, swinging along the Arkansas river (now closed) with tall red ochre cliffs, but with quite some twist in the reality, for in this location, there has never been any steel trestle, single track running at water level. It was decided that I would set prototype aside; MY Big Horn Sheep would have one of those trestles. No discussion. The photos linked below were shot circa July, 2000 by Philippe in Paris with some natural sun light. For photos of this S scale model railroad from Paris click each photo link below. Be sure to use the back button on your web browser to return to this page. Philippe's Diorama Backdrop crafted by a friend using some Photoshop pics. After 18+ years exclusively dedicated to U.S. HO scale modeling; with boxes of kits & rolling stock piling up; a first HO 20x12ft HO turnpike built over the years in a Paris basement, but now sort of worn out; and the layout of all dreams still out of sight for lack of basic square foot reason ! Let's say I was a bit tired; searching for new feelings; new start! With some of my French friends "playing around" with US railroads in S scale for some time, I decided to follow them, trading some of the HO stuff, and buying a few nice S scale brass "jewels." A year after, still enjoying the quite scarce equipment I had gathered, painted & weathered all D& RGW 1870 & early 1880 schemes, laying on my shelves, I was now thinking about some trackage to have it showcased. Let's call it the display for, downtown Paris; square feet are definitely scarce! Thus, I decided to launch the "Big Horn Sheep" Project, a 5ft long; 2ft 8in. height; 1ft 6in. 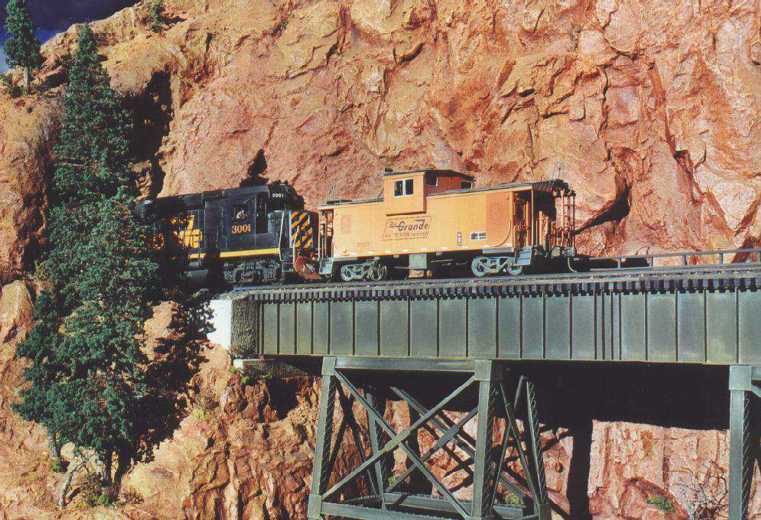 depth; which would bring some of my preferred US western landscapes to life : massive mineral & dry rocky cliff, mighty river flowing beneath, and as a masterpiece, a massive steel trestle. Chosen location (Big Horn Sheep) is a pretty neat spot of former D&RGW western main line of the Royal Gorge, swinging along the Arkansas river (now closed) with tall red ochre cliffs, but with quite some twist in the reality, for in this location, there has never been any steel trestle, single track running at water leve; but MY Big Horn Sheep would have one of those trestles; No discussion ! 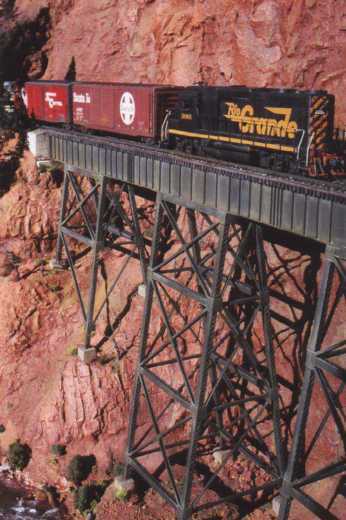 Trestle : the deck plate girder structure was built almost 100% from scratch with styrene (out of drawings produced in old issues of MR : July-Oct.1988); only "commercial parts" being the tower main girders (vertical & horizontal) who are Central Valley parts. Total work has exceeded the 200 hours for this quite unique model. Rocks : "Hard shell" technique (plastered tape), on top of which latex molds have been added on. (some of the molds are hand made; some ready to use, bought from a firm called Dream Miniatures; and one from Chooch). Rock paint job : hand brushed with oil based artist colors (transparent red ochre + brown ochre); then highlighted with raw sienna and even some touch of pale yellow, then sprayed with Mat oil finish, for fixing the paint, and bringing a semi gloss finish. 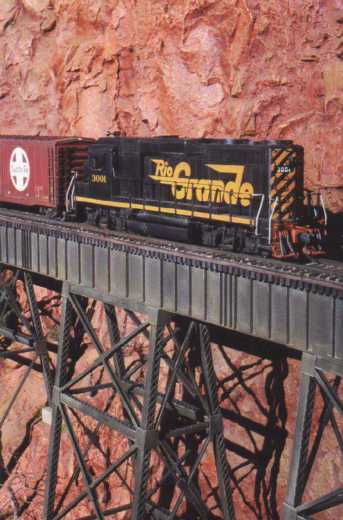 Roadbed & track work : Tomalco code 100 flex track set on a cork roadbed, fully ballasted with Highball HO scale products (cinder & a touch of dark gray). 40 ft. general purpose Gondola brass model imported by Drake. 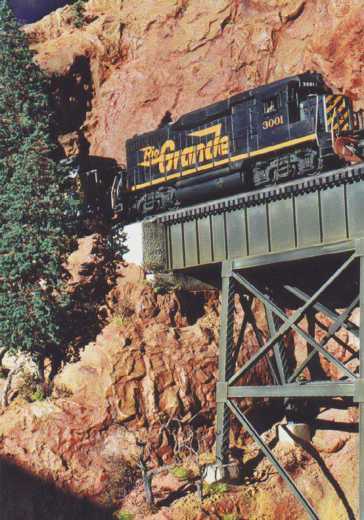 All the models are custom painted; and weathered using Floquil colors with an airbrush; and oil artist paints in dry brushing technique). This 1st S scale module, produced over a period of 7 months (3 months for the trestle; 200+ hours work-; 4 months for the scenery; 400+ hours work- , with quite intensive week ends & evenings!) is now over. It has traveled extensively in France in some exhibitions during the past months; and now, almost completed, is a"front end" (same size), who will produce another angle of view of the same scene; from across the river; handled in O scale (poles, road with fancy pick-up truck from Matchbox 1:43 series, rocks , yellow grass & huge pine trees); thus enabling some forced perspective to be artificially created. Next exhibition, both modules should be showcased toogether. All pictures of the display have been done outdoor. Using SENSIA II Fuji film (slides), with a NIKON F3 equipped with a 35/70 macro Zoom: all shots at f:22, with roughly 1/8 sec exposure. NASG Perles Publications Award, 1997.